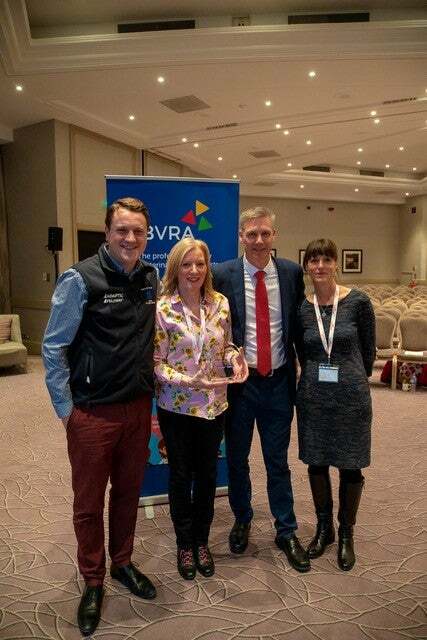 After launching its first Veterinary Receptionist of the Year award, earlier this year, the British Veterinary Receptionist Association (BVRA) received over 100 nominations from veterinary staff and clients alike. On Saturday 16th March at the Association’s second annual congress at the Belfry Hotel in Sutton Coldfield, founders Brian Faulkner and Kay Watson-Bray announced the winner – Kendall Clee of Blacks Vets in Dudley. Runners-up were Laurie Williams from Vets4Pets, Hereford, in second place and Kristin Hardin from Maven Vets in North Cheam, Surrey, in third place. All three winners received an award, certificate and vouchers. The winners were chosen by an independent judging panel who, despite the high standard of entries, all chose the same top three finalists. The awards were the icing on the cake of a successful congress which almost 200 delegates attended – more than double the numbers who attended the first congress in 2018. The 2019 programme included sessions on dealing with the angry client and communication, delivered by Brian Faulkner. Doug Muir of Compassion Understood talked about pet bereavement and clients. All delegates also received a free DiSC personality profile and could bring their results along to a talk by coach Carolyne Crowe as she discussed ways to improve performance based on an individual’s personality traits. Keynote speaker Benjamin Mee, zoo owner and author of ‘We bought a zoo’ also gave a fantastic and inspirational lecture that was very warmly received by delegates. The Association has also recently celebrated the graduation of its first fully accredited veterinary receptionists, with 11 members having completed the highest level Gold award which launched in February.